When a tiny fish shoots into view wearing a round blue topper (which happens to fit him perfectly), trouble could be following close behind. So it s a good thing that enormous fish won t wake up. And even if he does, it s not like he ll ever know what happened. . . . 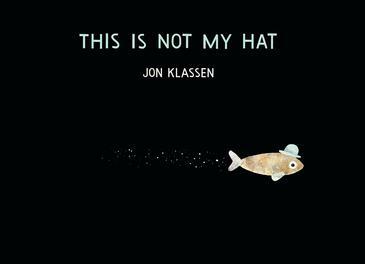 Visual humor swims to the fore as the best-selling Jon Klassen follows his breakout debut with another deadpan-funny tale. My absolute favourite book last year was I Want My Hat Back by Jon Klassen. The book was laugh out loud funny, and clever to boot. It was an exciting day when I heard there was a new Jon Klassen book coming out this year, and joy of joys it's here! The last book followed a bear looking for his lost hat. This book is also about a stolen hat, albeit a different one. This book is told from the point of view of the hat thief, and his genius plan to get away with his thievery! The cleverness of this story is that the humour is portrayed entirely in the illustrations. The story is a running commentary from the hat thief explaining how he stole the hat and fool proof plan to get away with it. The illustrations show that clearly the owner of the hat is on to him, and not far behind. Without giving too much away, I will say that the hat isn't the only theme that is carried over from the first book.